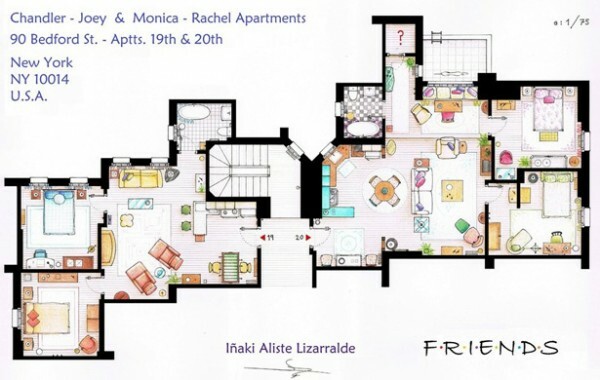 This entry was posted in Famous buildings and movie locations, General living and fun stuff, Homes of the rich and famous, Polls and tagged ab fab, apartment, Big Bang Theory, Brandi Roberts, Carrie's apartment, floor plans, friends, Golden Girls, homes, Monica's, NYC, nyc apartments, SATC, seattle apartment, TV, TV sets, TV shows. Bookmark the permalink. Yu are so right (and so funny) in your comments Pieter! I also miss the marks where the camera’s are situated! Are the walls maybe easy to move? I would like to condemn here the attitude of Brandi Roberts, author of any of these drawings, which sells through its web Fantasy Floorplans. This design diva is the responsible for which have eliminated my work of several websites. She is calling to these sites to complain that my drawings are a copy of their simple blueprints. is a copy of this? My drawings are artistic artworks, extremely acccurated in dimensions and proportions, coloured and full of furniturs and decoratons details. Her layouts are like a simple technical blueprints, undetailed and monochromatic. The only similarity it comes from the use os the same theme and the same sets to make both floorplans. 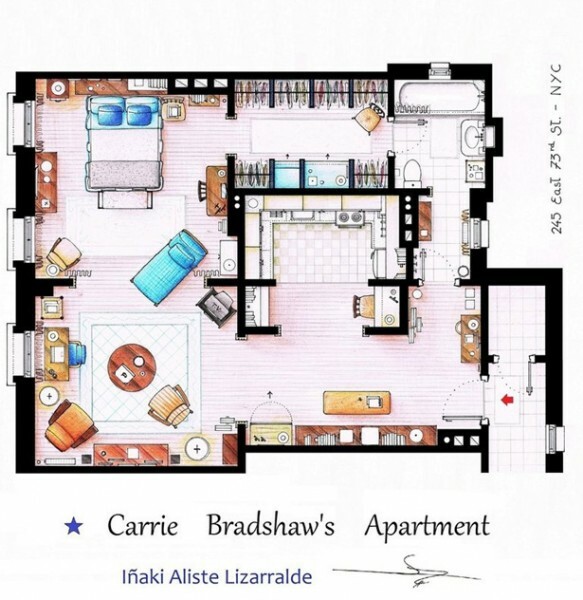 And he must believe with the exclusivity of being the only person in the world that can make floorplans of TV series. When a site as Deviantart or RedBubble receives a demand from copyrights automatically retires the artworks without making and analysis of the works. This woman (Perhaps envious because I am able to do it better than she, fearful to earn less money if someone likes more my drawings as hers) are systematically claiming an absurd copyright that she does not have and harm me professional and morally.. This is something absurd especially coming from another “artist”. We are all free to create what we want….